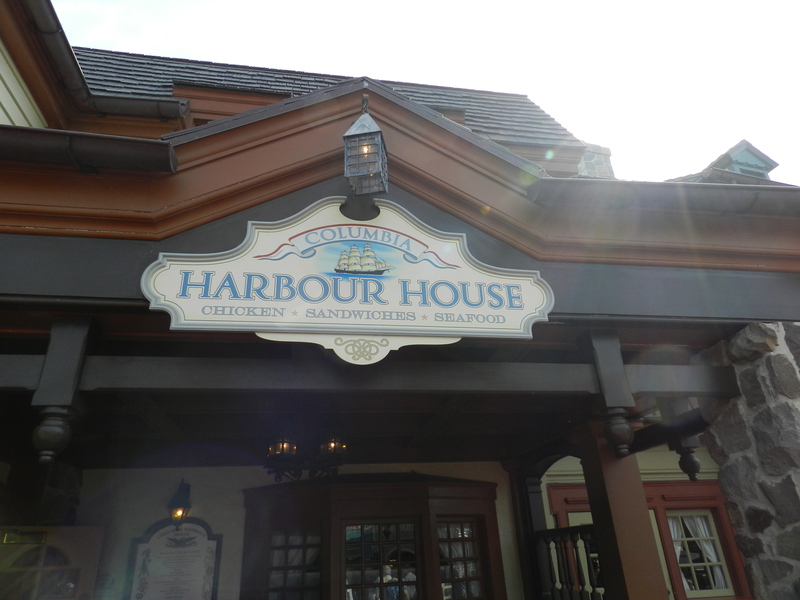 One of the must try restaurants for me this trip was Columbia Harbor House! I am a huge fan of seafood and this is the go to place in the Magic Kingdom for that. This quick service location is in Liberty Square, just look for the cast member ringing a bell. I mentioned seafood but that is not the only thing on the menu, there are salads, chicken pot pie, macaroni and cheese, and soups. For lunch I was torn between two options, luckily Jamie felt the same way and we agreed to split the two. The first one was the Lobster Roll with potato chips this was a hearty serving with lots of lobster and not a lot of filler. The roll it came on was so soft and delicious as well. I give this one thumbs up! 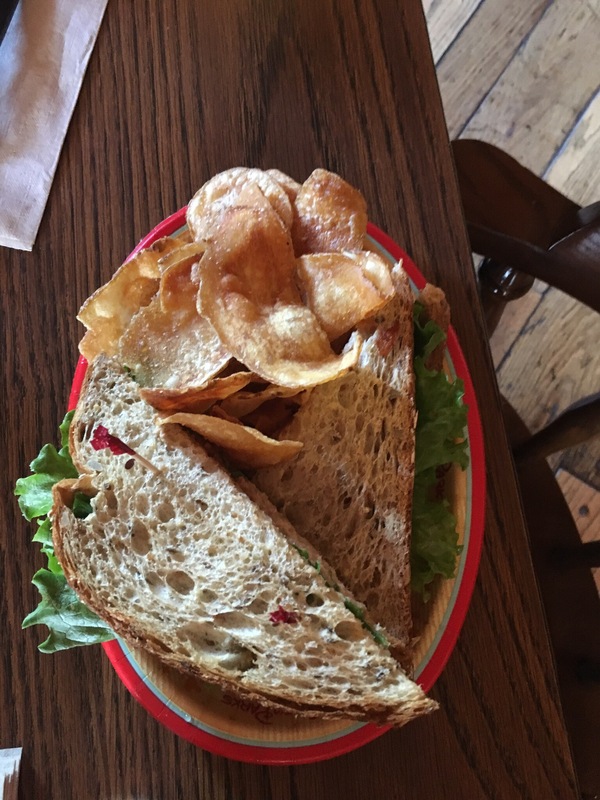 The other choice was the Anchors Aweigh Sandwich with chips. This was a tuna sandwich with lettuce and tomato on a toasted multigrain bread. This was even better than the lobster roll. I really really loved this. The tuna was very plentiful and the bread made the sandwich even better. I give this one 2 thumbs up and I would get it again! Jamie: I was so happy Jillian wanted to split our options for lunch, too! I couldn’t decide and really wanted both, but obviously didn’t want to eat both. 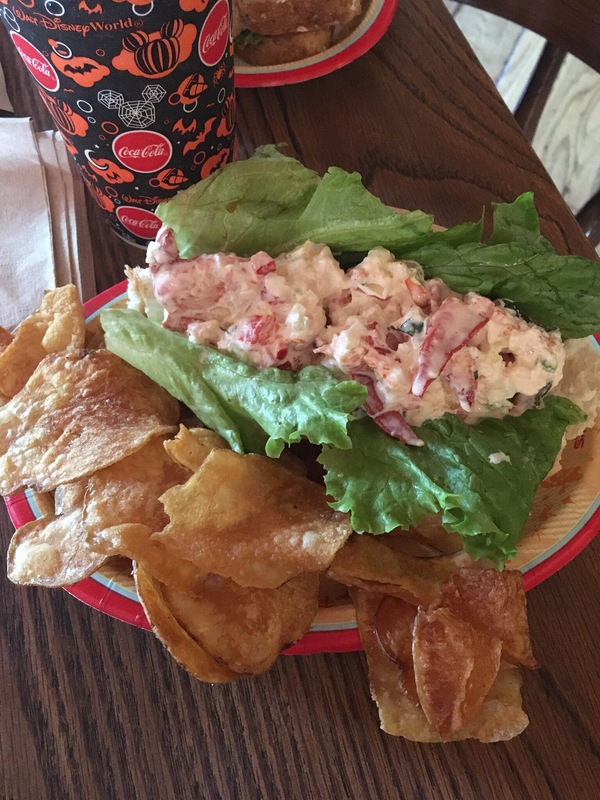 I’d previously had the lobster roll so I knew it was good, but I really enjoyed the tuna sandwich, maybe even more so than the lobster. Plus the house chips are really delicious! Both of these options are miles above the “typical” counter service restaurants most people think of. While I enjoy a good burger and fries at Disney, having options like these at Columbia Harbor House really make even quick dining at Disney really enjoyable. Tara: I had the chicken pot pie with steamed broccoli and since I thought that was super healthy I splurged and had the blackberry cobbler for dessert. 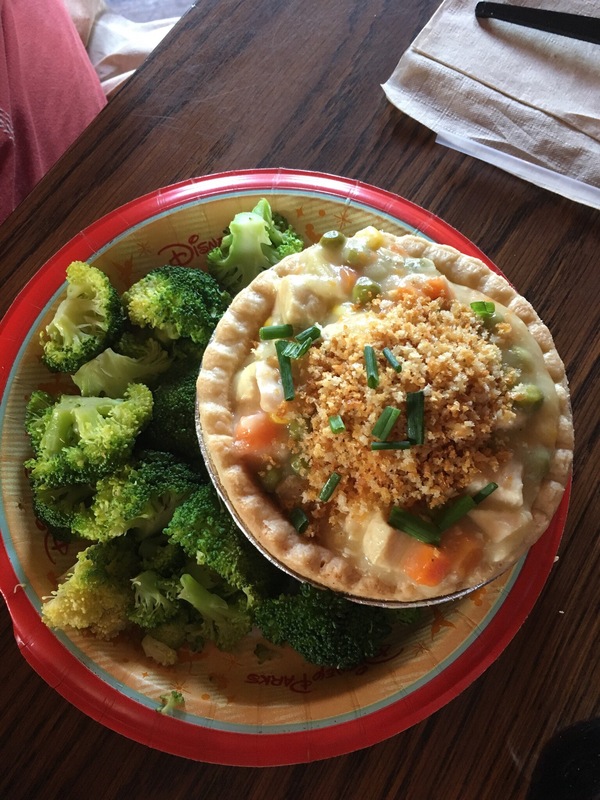 The chicken pot pie and broccoli were really good and filling. I could not even finish the pot pie because I needed to save room for the cobbler which was a huge hit. 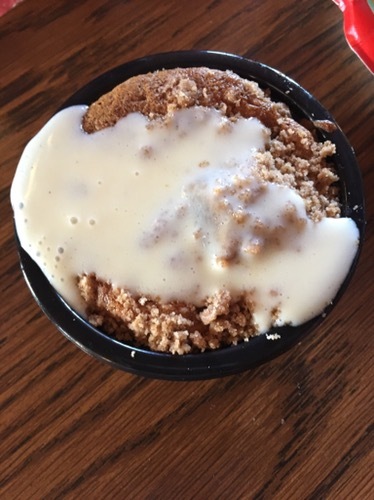 The cobbler was topped with a vanilla cream that was perfect and made it worth the broccoli side at lunch. I definitely recommend visiting Columbia Harbor House! Shannon: I had the chicken and fish plate. The fish was very good and cooked perfectly. The outside is crispy and light and the fish inside was very tender. The chicken nuggets are the same chicken nuggets you find in other areas of the parks and they are very good for what they are. The fries are basically the same as what you’d find anywhere else in the parks and that’s fine with me because I love them. I was not very crazy about the cole slaw that was included, but it wasn’t bad. I’m just picky about my slaw. Overall, I really enjoyed this meal. This is a popular place so go early or a little later in order to avoid a long wait time or lack of seating. The food is very fresh and filling and you can find something for even the pickiest eaters. Put Columbia Harbor House on your short list of quick service locations to try! 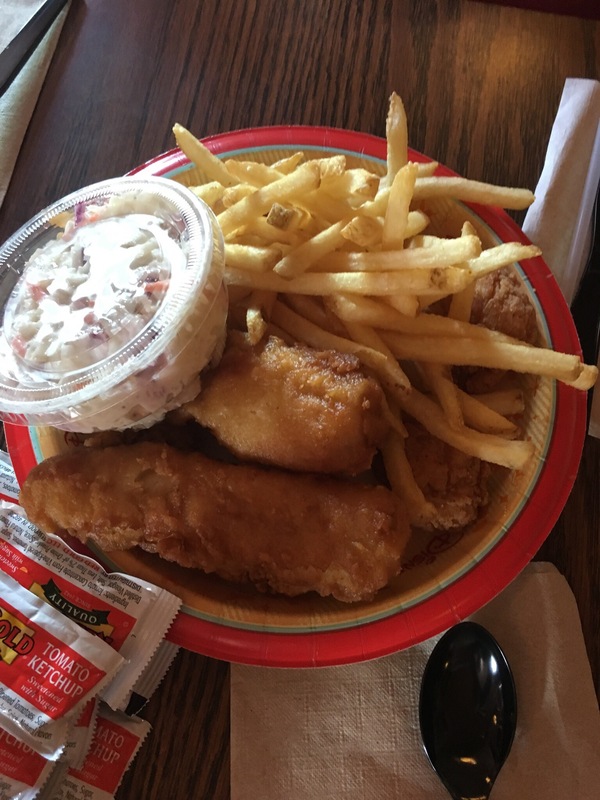 This entry was posted in Disney Dining, Disney World and tagged Columbia Harbour House, dining, disney, Disney Dining, Disney Quick Service, Disney World, food, Magic Kingdom, MK, quick service, quick service dining, seafood, Walt Disney World, WDW by Jillian. Bookmark the permalink.